Keldagrim is a large underground city, home to the Dwarves. It is a member's only city. To access Keldagrim, you'll need to start the quest, The Giant Dwarf. 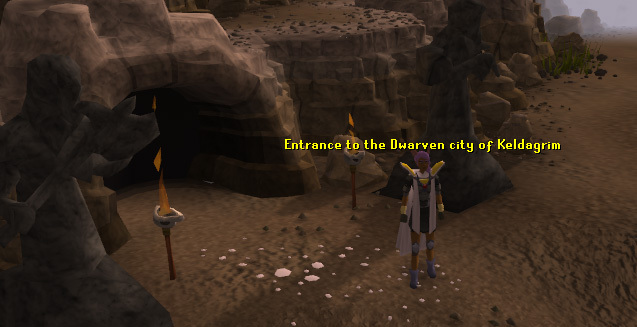 After starting that quest, you'll be able to explore the wonderful Dwarven city. In the city, you'll find a popular Activity, a large marketplace, a big train, and much more. There are two methods of travel you can use to get to Keldagrim. The first way is to walk to the entrance. Keldagrim is underground, so you'll need to get underground by going through a cave east of Rellekka. The entrance to the cave can be found on this map. The cave entrance is in a snowy area, guarded by two large Dwarven statures. Another method of reaching Keldagrim is by taking the mine carts from the Dwarven Mines or from the Dwarven Tunnel. Since September 9, 2009, the Mine Cart system is free to use for all travelers. Once you enter the cave, you will be on the first island of Keldagrim. Here, you will find several mines, a quest start point, and some of your friendly neighborhood dwarves. Here at the entrance, you will find two dwarves. One is the Dwarven Ferryman, and the other is the Dwarven Boatman. The Ferryman will take you across the river to the other side of the southern island, where you will find more mining sites and a quest start. There is a small fee of 2gp to be taken across the river, but if you wear a Ring of Charos (a), then you can travel for free. The Dwarven Boatman will take you to Keldagrim, and he is also the start point of The Giant Dwarf Quest. You can also find a level 20 dwarf wondering around the area. In the mine, there are five coal rocks and two copper rocks. There are also two level 20 Dwarves; one of them wanders back and forth from the entrance. North of the southeastern mine is a dock. Here you will find three dwarves. They are not very useful, but they are very talkative. Their names are Miodvetnir (blue), Dernu (green) and Derni (white). Here we have another mine site, containing four Iron rocks and a mineral vein, which you can mine to receive gold. Also, wandering around are two more level 20 Dwarves. The Eastern mine contains only five Tin Rocks, and has two level 20 dwarves wandering around. At the very edge of the river in this mining area is a Dwarven Boatman. This Dwarf is a bit different than the others. 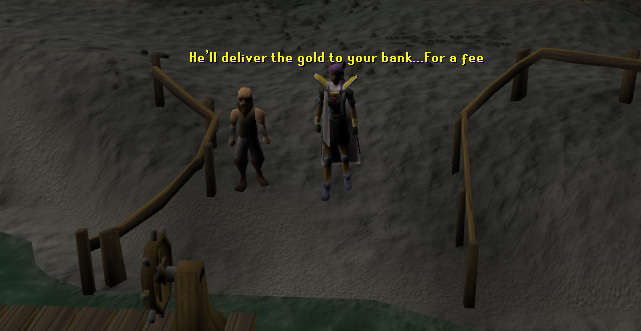 His job is to carry gold ore to people's bank, for a fee. The Boatman will bank your inventory of gold for a fee of one gold piece per shipment, and one gold ore for every five gold ore he takes to the bank. 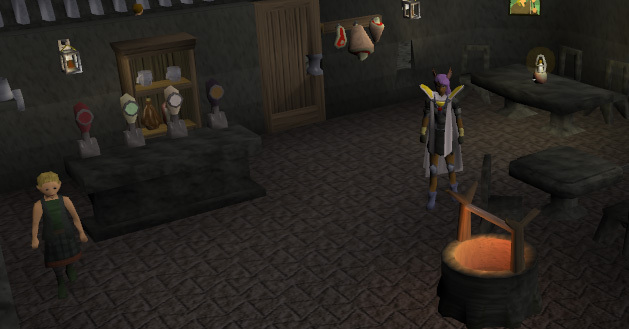 If you have a full inventory of gold, it will cost 6 gold ores to be shipped to your bank. If you are wearing a Ring of Charos (a), he only charges 3. 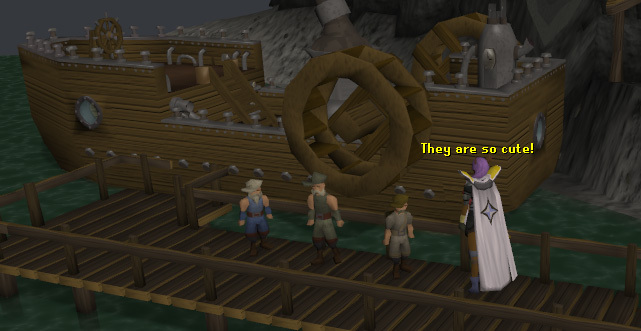 South of the mining area you can find the Dwarven Ferryman, who will bring you back near the three talkative dwarves for a fee of 2gp. If you do not have many money with you, then the Dwarven Ferryman will take you back for free. You can do the same thing by wearing a Ring of Charos (a). 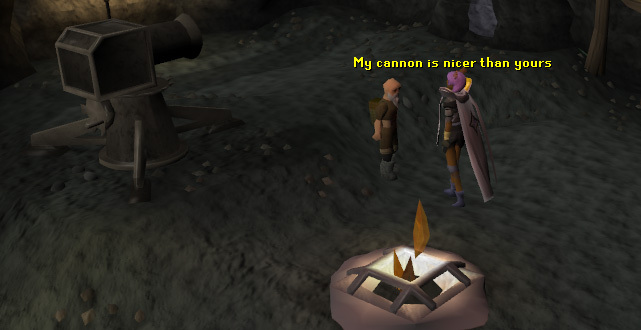 Here you can start the Between a Rock quest by speaking to Dondakan the Dwarf. Once you have that quest completed, you will be able to access the gold mines, but don't forget your Golden Helmet, or you won't be able to get inside. Remember that Dwarven Boatman? Well, now it is time to talk to him. He is the one that will take you to the bigger parts of Keldagrim, where you will find a variety of shops, more dwarves, and another quest start on the western side. 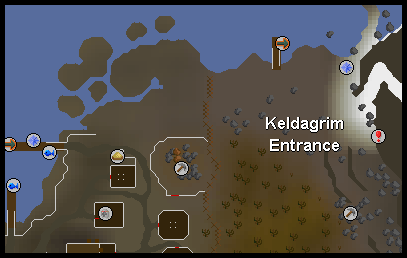 There are two ways to enter Keldagrim from the west side. One is the Dwarven Boatman, and the other is the Mine Carts. The mine carts will be explained later. This little port is where you will land when you talk to the Dwarven Boatman. He will drop you off here, and now you can explore the rest of the city. 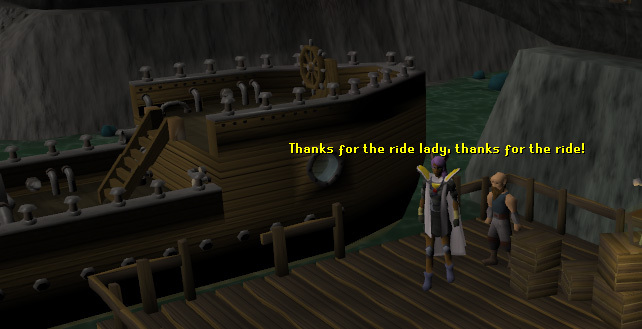 If you ever need to leave Keldagrim and don't have any money for the mine carts, you talk to the Dwarven boatman at the dock and he will take you to the docks on the southern island, and you then make your way west ward to end up at the same point you entered. This part of the guide will explain three different attractions that are very close to each other. 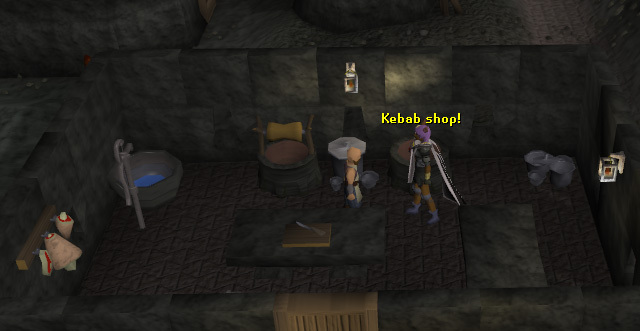 East of where the Dwarven Boatman drops you off is a Kebab shop. 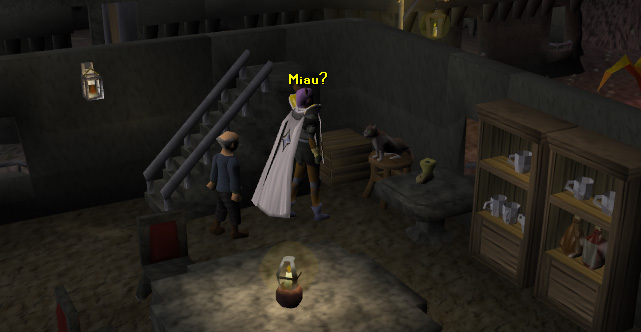 Kjut is the dwarf that owns the shop, and will sell you a kebab for 1gp. Outside of the Kebab shop is a well to fill buckets with water, and a dwarf named Ulifred. There is not much to talk about with Ulifred; he will ask you if you are the human that got arrested, from The Giant Dwarf Quest. North of Ulifred is the house of a friendly dwarf, named Karl. He will welcome you into his house if you talk to him, and you will have a conversation about your adventures in Keldagrim, how you entered the city, and helped out some dwarves. Apparently, he has short-term memory loss, because after telling him about all your adventures, he will ask you a question that you already answered. This part of the guide will explain four buildings and two rock formations close to each other. The first building is south of the Kebab shop. Here you will find Blasidar the sculptor, and Riki the sculptor's model. These two dwarves are used in The Giant Dwarf Quest. Inside their house, you will find sculptures upstairs and downstairs of dwarves. Northeast of the sculptors house is a little walkway made of two rock formations. It is just there for nice scenery. North of these rock formations is the house of a drunken dwarf. Whenever you talk to drunken dwarves, do not expect anything they say to make sense, and this dwarf is no exception. In his house, you will find eight pieces of broken glass on the floor. Moving north again, you can find a small house with no one in it. Next to this small house is a bigger house, home to Reinald. Reinald is a factory worker currently off duty. He will not say much, so lets continue our tour of the city. Once again, we have another mining site. You will find nine rocks of coal to mine. 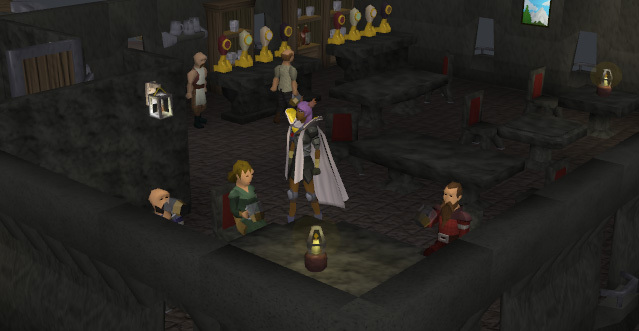 The only bank in Keldagrim in on the western island, so banking your coal might take some time. 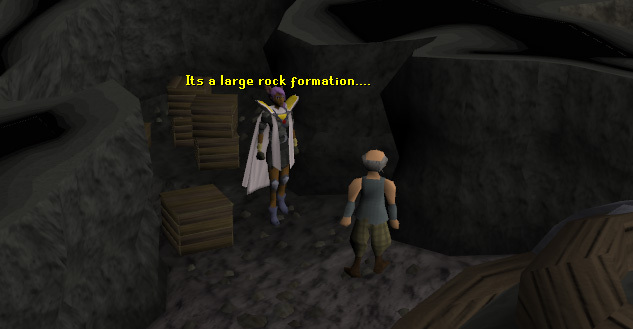 South of the mining site is a large rock formation with two dwarves in it, some crates, and some fires. One of the dwarves is Bentamir, who actually lives in the upper part of the rock. The second dwarf, Smokin' Joe, wanders around the middle part. 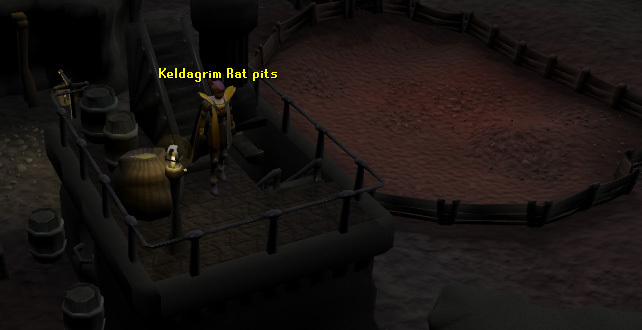 If you have completed Rat Catchers, then Smokin's Joe will teach you about the Rat Pits in the nearby pub. If not, then he will not reply to anything to say. The other dwarf, Bentamir, will speak his mind on being a hard-working dwarf. In the Pickaxe Shop, you will find an old dwarf named Tati who will sell you pickaxes bronze through rune. Occasionally, you will find Sune walking in and out of the shop. He is the son of Tati, and will go to the marketplace and back to the shop doing a variety of tasks for his father. 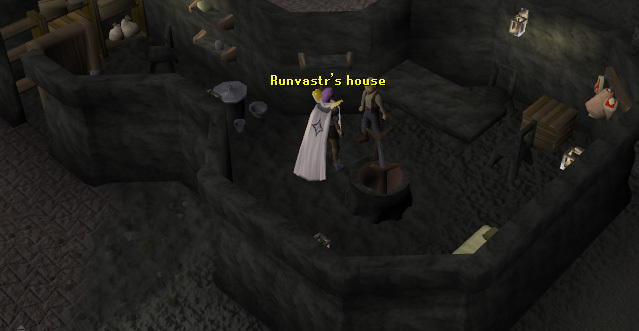 South of the mining shop is the house of an old dwarf, Runvastr. He will tell you about his depressing and hard life, and will eventually ask you to leave him alone and get out. There are two buildings that we will talk about. The first building is the Laughing Miner Pub, where you can find a barmaid. She will sell you stew for 20gp and a beer for 2gp. Upstairs you can find Blandebir and a place to brew ales. Blandebir is the dwarf who will help and teach you how to start brewing. Downstairs is the Rat Pits for overgrown cats. Outside the pub is a small building with a cart conductor. He is on a break, and he won't sell any tickets for the mine carts. Also, you can find the Rowdy Dwarf walking around the pub, who is part of The Forgettable Tale of a Drunken Dwarf Quest. This is probably one of the most popular buildings in Keldagrim. 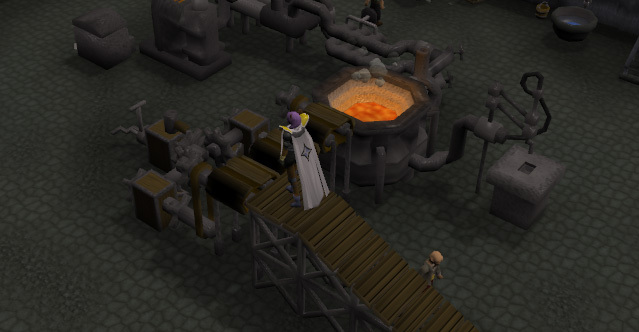 This building is the home of the Activity, Keldagrim Blast Furnace! In this Activity, you will be able to smelt metal bars using only half the number of coal as you would normally need. This game is all about teamwork and cooperation, so get together some friends and start smelting. The Blast Furnace takes place downstairs of this building. Upstairs you can find a few Factory Workers, who are refining the ores that are being brought into the factory by the Dwarven Miner. 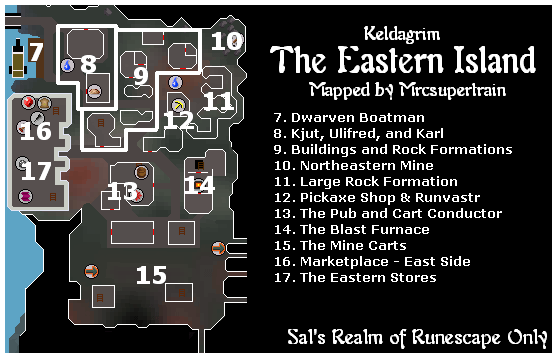 The first place is under Ice Mountain, which is actually in the Dwarven Mines. The mine cart is located a few steps south from the pickaxe shop. The second mine cart is under White Wolf Mountain. It is located east of the pub. 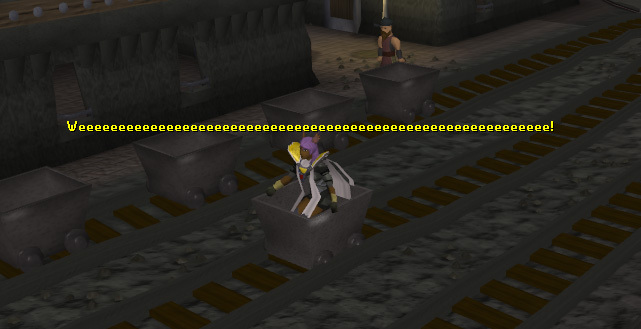 The third mine cart is located below the Grand Exchange. 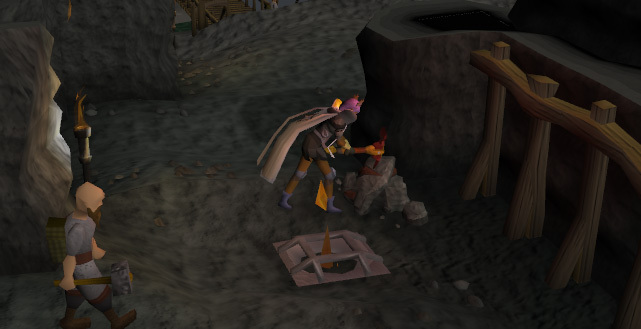 To access it, enter through the trapdoor found just northwest of the Grand Exchange, and just south of the Agility shortcut. Track 1 is used for transportation to Ice Mountain, and Track 4 is used for transportation to White Wolf Mountain. 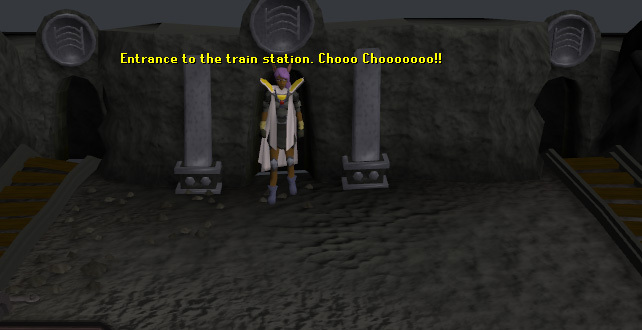 There is one more attraction at point 15 in Keldagrim: The train station. The train station is located northeast of the mine carts. You can see this point by another transportation symbol on the map. 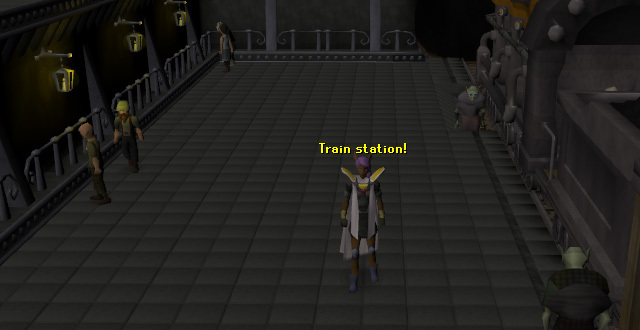 Players who have completed the quest, Another Slice of H.A.M, will be able to enter a doorway and use the train that transports players to and from the goblin city, Dorgesh-Kaan. To use the train, simply walk onto it and wait about 20 seconds for it to take off. This train ride, due to you being involved in the creation, is free of charge. The last thing to see on the east island is the the eastern market. This side of the market is made up of a variety of stalls, such as a Bakery stall, gem stall, crafting stall, crossbow stall, silver stall, and a clothing stall. 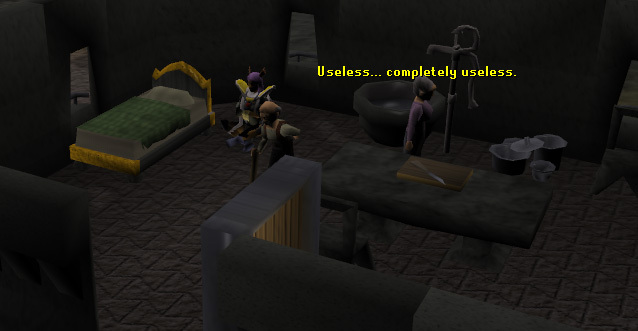 All these stalls also have a "Steal-from" option, making it a nice way to train your thieving. However, be on your guard, as members of the black guard are always patrolling the market. At stated before, there are a lot of stalls set up in the marketplace. This part of the guide will give more detail on what the store is, what it sells, who owns it, and what are the prices for it. 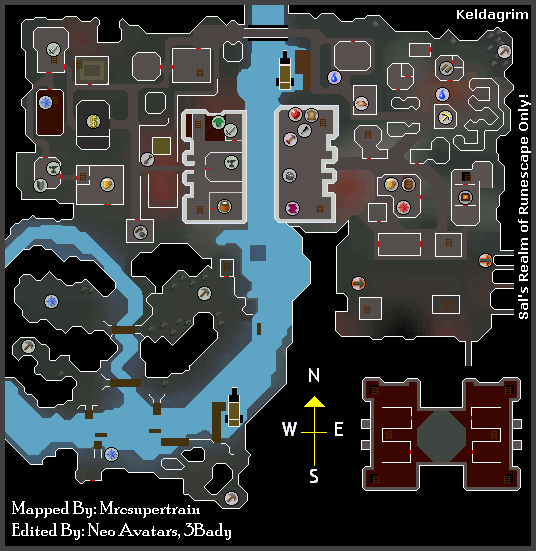 We have covered almost the entire city of Keldagrim! Only one more island left, which is the western island. Here in the west side you can find the western stores of the market place, some outside-marketplace shops, a bank, and a quest start. There are two different ways to enter the western island. The first method is to cross the bridge at the top of the eastern island. The second method is to walk upstairs into the Dwarven Consortium from the east side of the marketplace, and walk across to a set of stairs, which will lead you to the western marketplace. 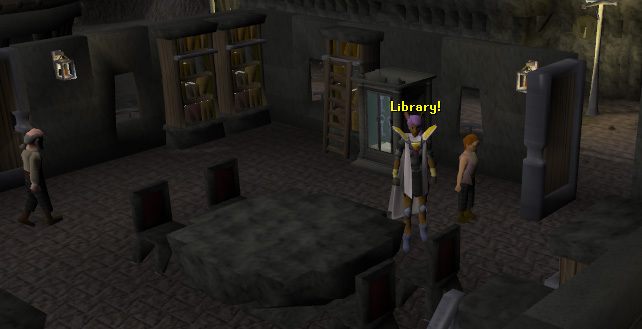 The Library contains about nine bookshelves, The Librarian, the Assistant, and a customer, who is human! The librarian will be able to tell you about the library and impenetrable rocks. The assistant will tell you about the knowledge of the library. She will sometimes try and help you find something in the library, or ask where you are from. Sometimes she will just tell you to SHHH! The human customer is here in Keldagrim looking for knowledge. The library is a two-floor building. 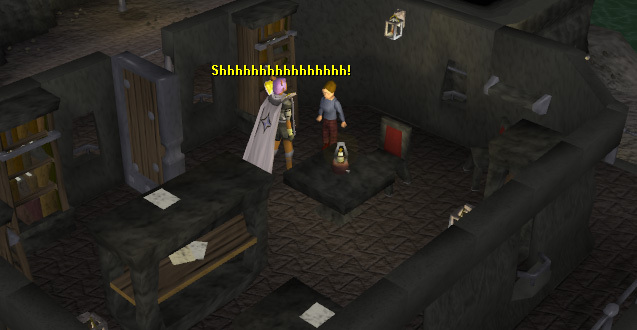 Upstairs you can find a dwarf customer, who will constantly tell you to be quiet whenever you talk to her. After all, you are in a library. In this house, you can find Hegir and Heara, two old dwarves "happily married". Hegir and Heara argue a lot and are not that useful to you or your adventures. If you want to see two dwarves yell at each other, then Hegir and Heara are just the dwarves to watch. Wandering around Hegir & Heara's house and the Library is a dwarf named Myndil. Myndil is a friendly dwarf. You can ask him about the news and if he has any quests for you. This is the house of Dromund and his cat. They play a part in The Giant Dwarf quest when you collect The Exquisite Boots. Dromund's house has three floors. The second floor is his dining area where he eats, and the top floor is where he sleeps. This building is a shop owned by Santiri. He sells a variety of swords and some bows & arrows. This is the house of Commander Veldaban. He is part of The Giant Dwarf quest and the Forgettable Tale of a Drunken Dwarf quest. 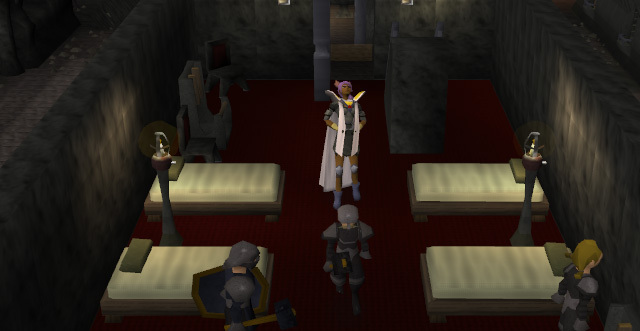 Inside his house, you can find some members of the Black Guard, including level 66 Black Guard Berserkers. You can find more black guard members outside his house as well. Upstairs is the Supreme Commander and a Black Guard Berserker. Here we have another store, where you can buy chainbodies, medium helmets, and some shields. Welcome to the King Axe Inn! This is a friendly pub with some friendly dwarves. The first dwarf is The Barman. 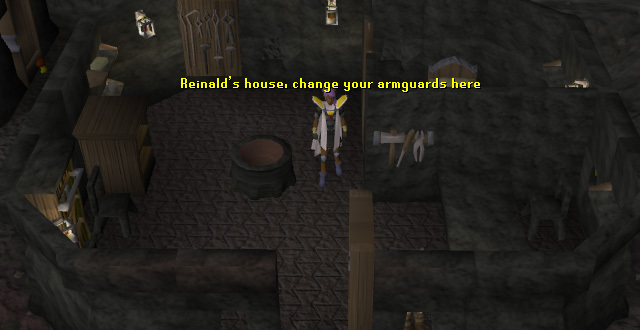 He will sell you beer for 1gp, a Dwarven scout for 2gp, and a Jug of Wine for 20gp. Also in the pub is Gauss. Gauss is a friendly dwarf, who will ask you to cheer with him. So, go buy a beer and cheers! Upstairs is the Innkeeper is in charge of the rooms found upstairs. Nothing useful up here, so head back downstairs and have another beer! 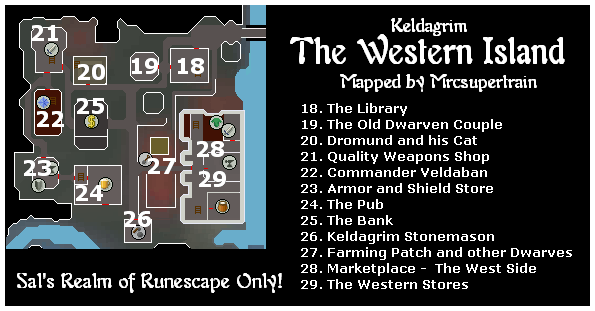 Keldagrim's one and only bank is located here on the western island. This bank is rarely ever crowded and is quite useful. 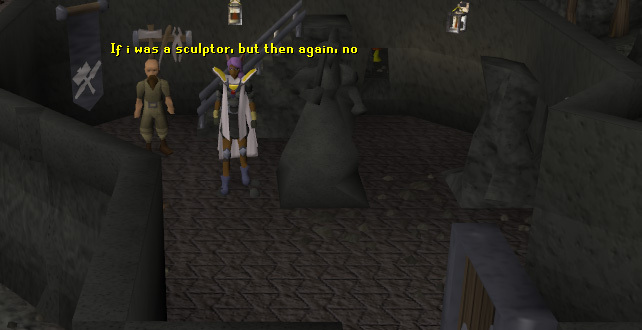 You can withdraw money to go shopping at the stores, get supplies for Keldagrim quests, or bank your ores from mining. This is a shop for buying medium to high leveled construction equipment. Do not expect cheap prices here, as they are very expensive. The only cheap item sold are limestone bricks. 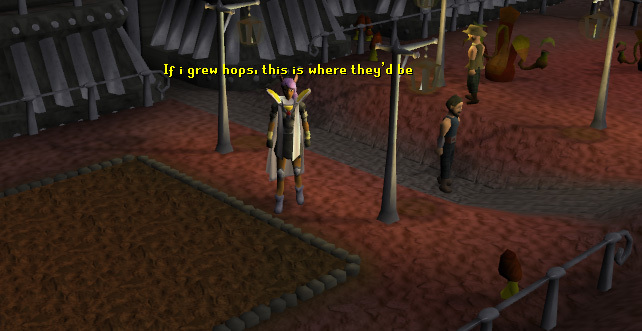 This area contains two dwarf farmers and a farming hops patch. The first dwarf is Tombar. Talk to him and you will ask about his height, as he is a taller dwarf the others. He won't like that comment, so it would be best to leave him alone. Next, we have Rind the Gardner. Rind and the hops patch are used in the Forgettable Tale of a Drunken Dwarf quest. If you talk to Rind, he will tell you about his garden. We have reached the west side of the Marketplace. A general store, a weapon store, and a clothing store are the only three stores found in this side of the market. There is also a building containing a gnome used in Gnome Restaurant Activity and two engineer dwarves. 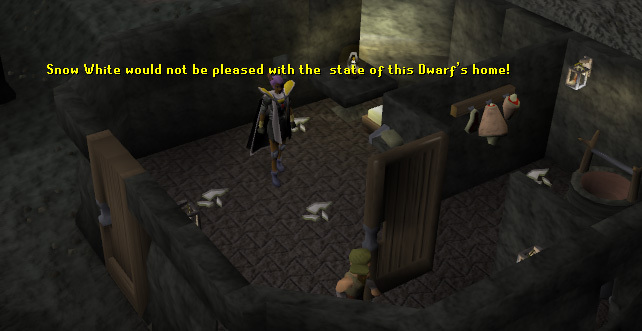 The dwarves don't say much and are very busy. There is also an anvil here for all your smithing needs! Once again, this part of the guide will explain the western marketplace stores, describing it's prices, it's owner, and what is sold. 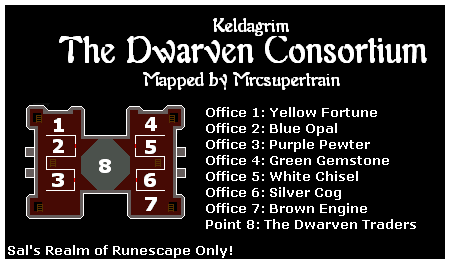 The last attraction in Keldagrim is the Dwarven Consortium. The Dwarven Consortium is found upstairs from the marketplace. On both sides of the marketplace, you should find a two set of stairs. Walk-up these steps to enter the Dwarven Consortium. 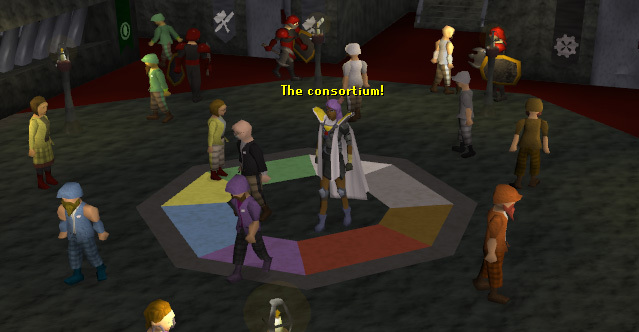 The Consortium is used in The Giant Dwarf quest when you need to sculpt a head for the statue. There are seven different companies that work here, and in the middle we have about fifteen trader dwarves who are buying and selling ores. As I mentioned before, there are seven different companies. They are Yellow Fortune, Blue Opal, Purple Pewter, Green Gemstone, White Chisel, Silver Cog, and Brown Engine. During The Giant Dwarf Quest and after the quest, you can work for a specific company of your choosing. Your tasks are mainly to bring back a certain amount of ores and bars within a time limit. You will be rewarded with cash for completing your tasks.